The Frankfort Plant Board's customer support page provides solutions to common issues regarding your utilities. 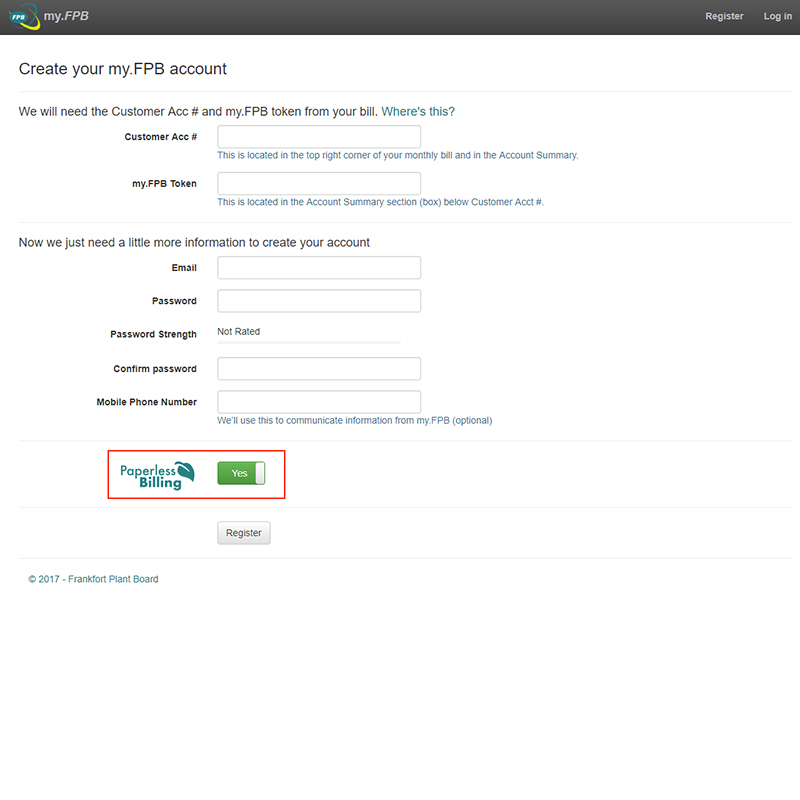 Customers can search www.fpb.cc, review FAQs, submit comments or questions and much more. Experiencing trouble with your service? Looking for the FPB Cable Building and Studio? The FPB Cable building and home of FPB-TV is located on 306 Hickory Drive, on the left just before East Frankfort Park. FPB eBilling is a fast and convenient way to monitor your FPB bill, ensure you never miss a payment and avoid late fees by paying on time, every time. With online bill view, FPB customers can stop receiving paper bills and access their bills online. FPB's Bank Draft ensures payment of FPB bills on time, without having to write and mail checks. Questions about Speedpay Bill pay? Click here to visit our FAQ. With FPB's Bank Draft you'll still receive a monthly bill detailing your FPB services and the amount due but you won't have to remember to write a check or come downtown to pay your bill. Attach a copy of a voided check. Good for the environment and good for your wallet. FPB Paperless billing will send you a monthly email when your bill is ready to view online, saving you time and money. The billing schedules are provided for informational purposes only and may be subject to change. Failure to receive bill does not relieve you of the obligation to pay bill. 1. Cycle refers to service area (based upon geographic area and cannot be changed by customer request). Cycle numbers are located in the account summary box on your billing statement. 2. Bill Date is the date the bill is generated and sent to the account holder. 3. Due Date is the date payment is due in our office. 4. Late Fee is the date any past due balance will incur a late charge. 5. Disconnect is the actual date service will be turned off. To avoid disconnection, payment must be received in our office the business day prior to this date. If you haven't found what you're looking for on our site, or if you have questions, comments, or suggestions regarding FPB, we'd love to hear from you. Please take a few minutes to fill out the form on the right to tell us what's on your mind. If you indicate you'd like an FPB representative to contact you, we'll make every effort to reply as quickly as possible. Fields marked with an * are required. When you've filled out the form, press the Submit button. Please help us locate your account information by providing your FPB account number. Thank you for your submission. All messages are carefully reviewed. If you've requested a contact, an FPB representative will contact you as soon as possible. Use the Search field to quickly scan our website for relative information regarding your question.